Counsilman-Hunsaker, in association with Kimley-Horn & Associates, was hired by the City of Independence to replace their outdated 1962 pool. 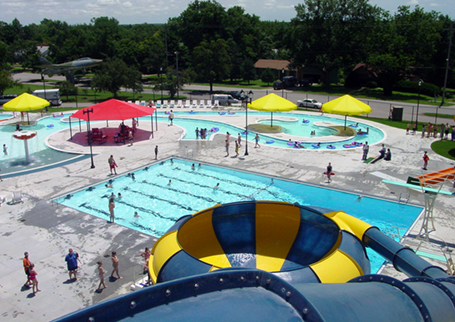 The city desired a centerpiece facility to serve the aquatic needs of the entire community. The concept was to create a municipal family aquatic center with play features for tots, families, and teens. The main attraction is the bowl slide, which offers exploratory riders a 32 ft. tower with a chance to shoot down a 95-lineal-foot waterslide into a splash bowl, where they swirl around the funnel, then exit by a vertical drop of 37 ft. into a catch pool complete with exit stairs.